Anyway, the weather here in SC has been gorgeous the past few days and this sweatshirt tee from J. Crew (last year) is the perfect thing to throw on. Until Spring has officially arrived, you can find me soaking up every little bit of sunshine I can get in short sleeves + boyfriend jeans. comfy and gorgeous! I love it! your hair is gorgeous!! It's not extensions is it? Im so jealous lol! this outfit is so cute and so summery. 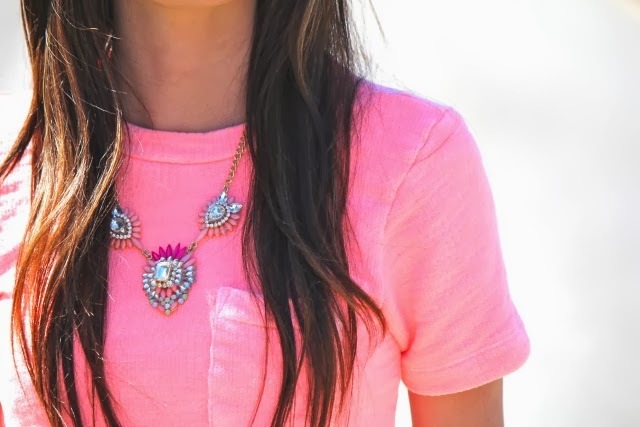 i love the bright pink relaxed shirt with the statement necklace as well as the perfectly ripped jeans to complete the look. super cute! wish i could pull off boyfriend jeans! 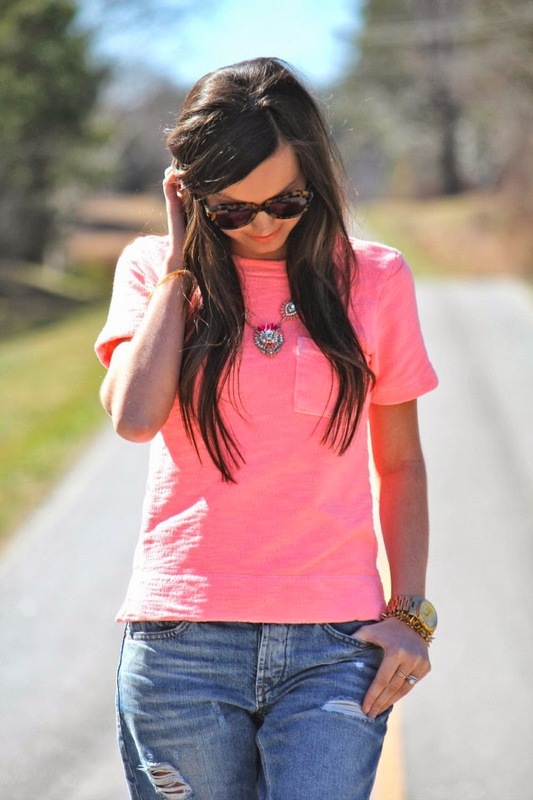 Loving those boyfriend jeans and the pop of pink from that top! Hi Megan, really love the color of the top, and I need to get into my boyfriend jeans myself, aren't they comfy! Looking lovely as usual. If you have time to stop by my new site, it is www.elegantlydressedandstylish.com thanks! I'm crazy about this look! The fabric/texture of the top is the coolest take on a t-shirt. I love the way you wore it, too! Love how you styled this top! I have this shirt too and always appreciate other ideas on how to wear it! And I love that you are wearing flats with your boyfriend jeans, it make the outfit much more comfortable and possible to wear than in heels!